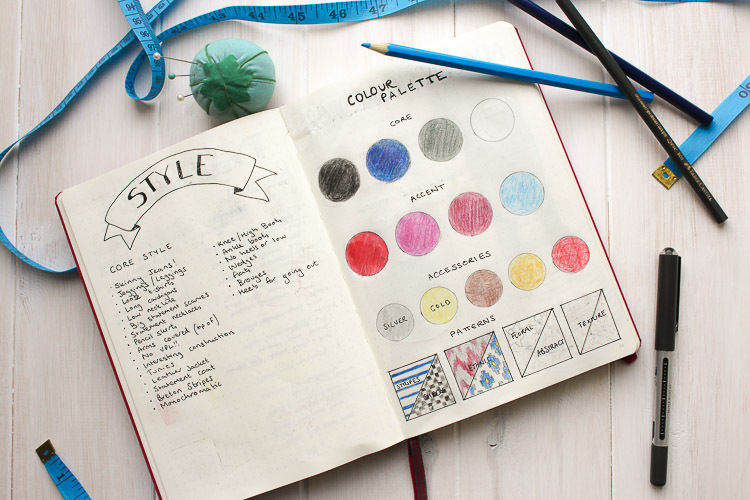 The Bullet Journal concept has been around for a number of years now, and there is quite a big fan club (if you are new to the Bullet Journal, here’s an introduction from the creator), however I only discovered it for myself mid-2016. I have always been very into stationery (a stationery shop was my childhood equivalent to a fabric shop now!) and the love for organising myself with to do lists, diaries and notebooks has never really left me. I have, however, always struggled with using pre-made diaries. None have ever been exactly ‘perfect’ for me. At any one given time I have a number of notebooks and organisers on the go; my diary, sewing planner, blog planner, meal planner, general note taking etc. The list goes on! 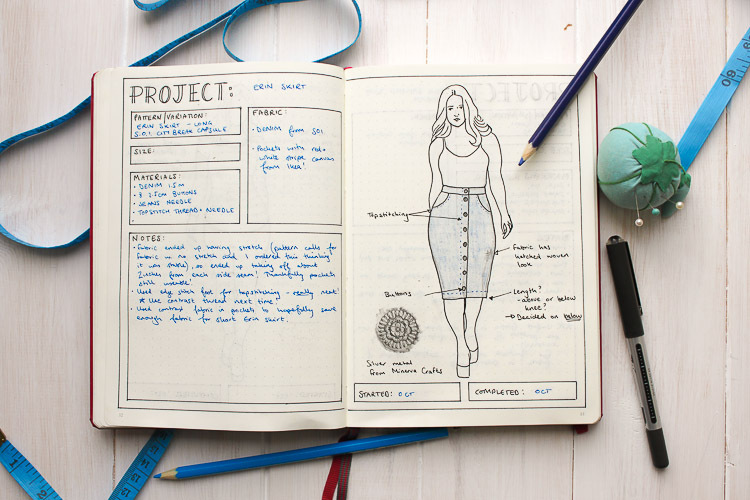 So when I came across the concept that I could just create a diary/planner to suit my specific needs, it was almost like a smack in the head – the solution was so obvious, I was annoyed of not thinking of it for myself sooner! At roughly the same time that I was discovering the Bullet Journal, Colette Patterns came out with their very lovely Sewing Planner. Oh how I wanted that planner! I was going to order it directly from Colette, but realised that the postage from America would double the cost of the planner and I just couldn’t bring myself to spend that much money on a notebook (side note: you can now pick up the planner from a number of UK suppliers)! 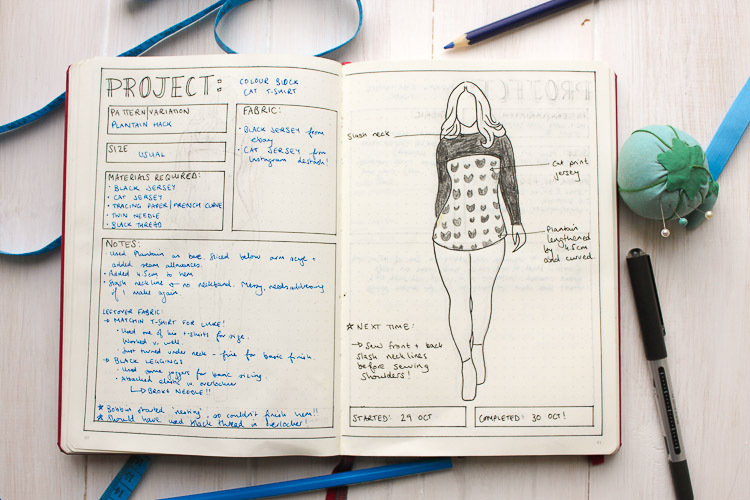 So I wondered how feasible it might be to combine a similar sort of sewing planner into a bullet journal. 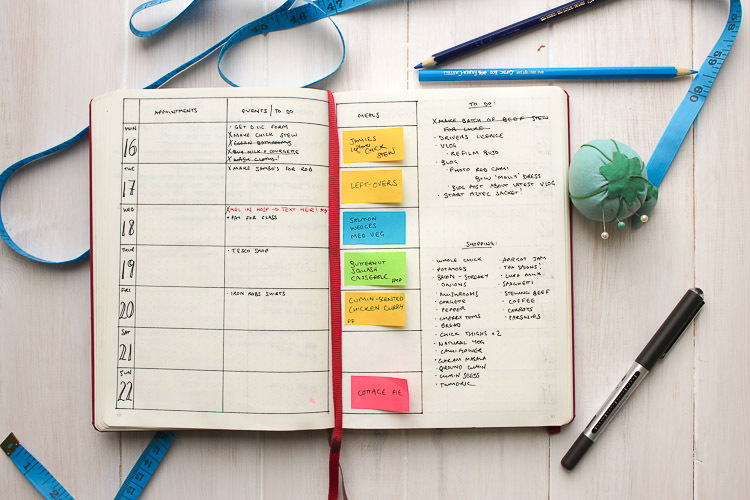 Turns out, it’s very easy and I absolutely love my all-in-one planner that I now have. Let’s have a look. If you would like to have an in depth nosey into my Bullet Journal, I have done a full flip through on my vlog (you can watch it above). Today, I’ll just run through the key pages. So above is my typical weekly layout that I use to keep track of my time specific daily appointments, daily events, meal planning, to-do list and grocery shopping. This set-up works so well for this point in my life as a stay-at-home mum. If I was still in my old job I think I would definitely need a daily spread as well (my to-do list was always very long!). The colourful post-it notes are my latest attempt at keeping on track of my meal planning. I have tried so many ways of meal planning, and this way has just been revolutionary for me. If you are interested in meal planning (and I really recommend meal planning – it saves you money, reduces food waste and saves stressing each day about what to eat!) then I explain it all at the end of my vlog above. OK, that’s the boring part of the BUJO out of the way, now lets focus on the sewing aspects! 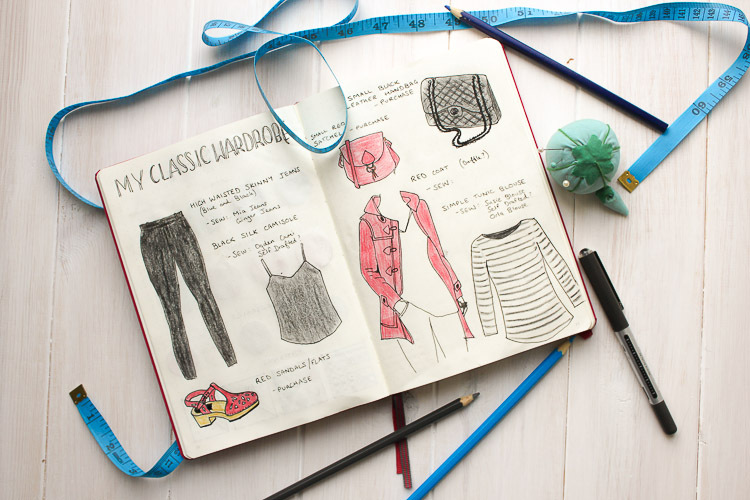 One of the elements I wanted to include was a very pared down version of the Colette Wardrobe Architect, a sort of snap shot of my current style. So I came up with the above layout, which shows on one side a bullet list of my core style elements, while on the other page I have my overarching colour palette. It’s a great reference page, and I love having it in my planner, always to hand, to glance at and become inspired by. Utilising my colour palette is something I really want to work on, going forward. I feel that I am a bit haphazard when it comes to purchasing fabric, and I believe this has, in part, played to the accumulation of quite a substantial stash. I’m hoping if I keep my colour palette in mind when thinking about purchasing fabric, I will end up adding pieces which will lend themselves to be transformed into garments that (hopefully!) will easily slot into my developing wardrobe. My next spread is a bit of a fun, aspirational reference page. A summary of key pieces which I believe to be the core of my ideal classic wardrobe. As I say, some of these are aspirational – such as the little black leather handbag, which is blatantly inspired by a Chanel handbag! I will never own a Chanel handbag, but it’s a style of bag I would like to own. Obviously these aren’t all pieces to make. I’m not planning on crafting my own leather handbag or red clogs! But I would like to add some high waisted black skinny jeans, a silk camisole and some simple tunic blouses to my core wardrobe. I have also always been on the look out for the ‘perfect’ red coat, so I’ve included that in this spread too. Whether I will make this or not is to be seen. The spread was partially inspired by analysing the reoccurring themes that I could see running through many of the style pins I found myself pinning. More often than not, I am drawn towards quite monochromatic styles, with accents of red. I have pinned so many images of red shoes….but I don’t own any! So I am on the look out for the perfect red flats (I don’t wear heels anymore). I love the large croqui on the right hand side. I actually have a blank template of the croqui (which I downloaded from here, I thought her shape matched mine quite well!) that I keep in the back of my notebook and use to trace out for each project. On my sketches I like to add details that either I plan to include, or eventually did include once the garment was made. The box for my notes I tend to use more during the construction, which I then can refer back to for either writing up blog posts (ha, don’t laugh too much! I know I have been rubbish at doing that!) or if I plan to make the pattern again. If you would like to see more of my project pages, and hear a bit more about how I lay everything out then please do watch the vlog as there is a lot more detail there. 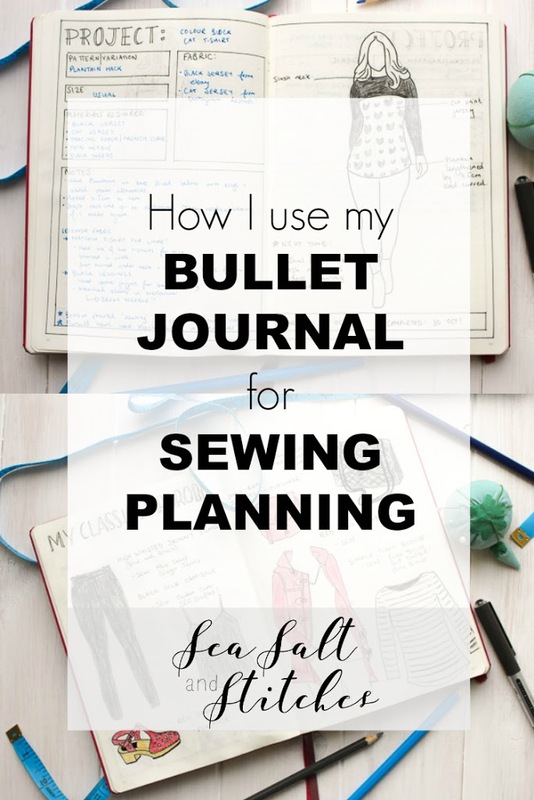 Well, I hope I may have inspired you to either start a bullet journal, or perhaps a sewing planner. I would say that the biggest down side is the amount of time it takes to initially set the planner up, and then each month draw up your pages. But I just love how tailored it is to my exact needs. 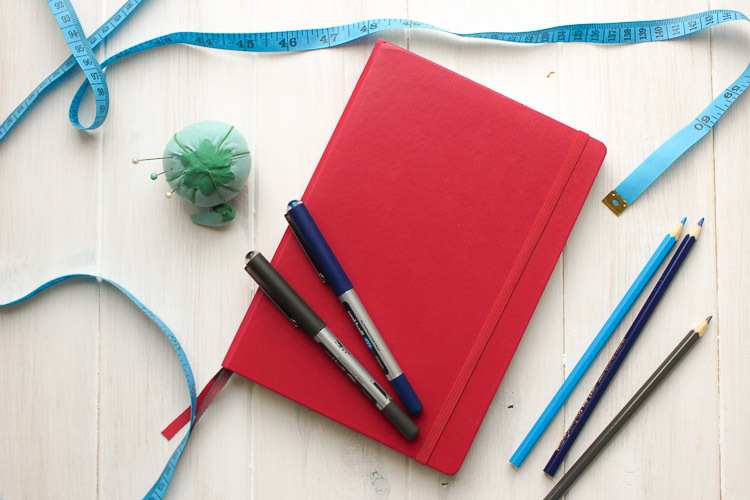 Do you keep a bullet journal, or keep notes on your sewing planning? I would love to know how you do it! For information, the specific notebook I use is the Leuchtturm 1917 dotted notebook in Berry, which I just picked up from Amazon. It’s not the cheapest notebook out there, but the pages are a nice weight which pens don’t leak through easily. It also has two bookmarks, which I find so useful for marking both the monthly spread and weekly spread. Finally, the dotted option allows for a very feint grid to aid with setting up your pages, but isn’t remotely distracting for sketching on. I would highly recommend them! I've had a long history of getting excited about a certain planner and then figuring out how it didn't actually work for me, so I was similarly hyped to figure out I could make my own with the bullet journal! I've been using it for a few months, and mostly focus on the month and week layouts, not so much the collections piece. I haven't had time to figure out exactly what I want to do there, but I think I will definitely have to include something similar to your style/palette/key pieces layout – that will really come in handy shopping! oh and another thing I did was to print off a little picture of each of the PDF patterns that I own but haven't got around to sewing yet. They are there as a reference, and also to keep them in sight so I don't forget to make them! I've also set up a table to list the fabrics I've ordered, how much, fibre content, and what garment I was imagining. Some of them are custom designs so they will take a few months to get here. i love this layout! And thanks for the link to the croquis.I am going to try to implement a system like this for 2017, so I can keep track of what I was aiming to do with the fabric I order online. Oh my goodness! Thank you, thank you, thank you! Reading this was like reading about me and my copious number of notebooks and lists. I have just start a bullet journal and and slowing finding my way with it. I wanted to include some sort of sewing planner as I have planning sheets but they get lost and are difficult to keep to hand. Having the planner in my bujo seemed like a no-brainer BUT where to start? What I had been using didn't really work in the bujo format. Then your blog post popped up in Blogger and couldn't be better timed! You have given me so many ideas to use as a basis for mine, now I have a starting point, instead of floundering around unsure what to do. I love the croquis tip so will be using that. I'm also going to "steal" your menu planner idea. How clever! I've just found your blog, and I think we could be soul sisters across the pond! I could spend hours in the stationary aisle of any store, and my favorite outing as a kid was always when my mom would take me pen shopping! I appreciate your detailed post. As an adult I have tried countless different planners, and have never found a system that truly worked for me. I am just starting a Bullet Journal, and hope to really make it functional. I also have the Colette planner, which I love, but have been rather lax in using. Thanks for all the inspiration, I'm excited to follow along with your planning and sewing!